Does sloppy writing imply sloppy work? It might. Why would you want to risk that? Proofread and edit everything. If you can, get someone else to do it, before your reader sees it. Reading with a card or something can help but isn’t it difficult when you have to proofread an article on your computer or laptop? I think it is. In fact, for me it is impossible. So, I am using other techniques to make sure that what I write (other the comments) is typo free. 1. I use Google Dictionary, that I have embedded in my browser, to check the accuracy of each and every word by double clicking on it. When you would do so, and if you would, a pop-up window will show the meaning of the word you have written. 2. To check names of individuals, places and companies I use Ctrl+F function. With this, you can actually search and replace all the names in your document, just before hitting publish or submit. Thanks for sharing your methods, Imran! Great tips. I found your thoughts about digital marketing to be intriguing. For me it was exactly opposite. I have a degree in Communication and Psychology, purchased courses in writing and even wrote prolifically. But submitting to offline magazine editors just didn’t work for me. Maybe it was a confidence thing like what you experienced, I don’t know. What I do know is that when I went digital everything I wasn’t able to do with paper and pen became instantly doable. I would have never thought of this. Such a great idea, Tasha! I agree – I like the idea of reading your writing out loud. It also helps you to review your style, as anything awkward or overly formal will stand out straight away when it’s spoken. Some real good tips, looking forward to implement it right from the very next post. Great article Stephanie, I really enjoyed the read. Although I now have an editorial team to work with and pass my content to for final proofing, in my previous role I had to do it all myself. I used the first method you have described and as time consuming as it was – it worked. That said, I wish I had known about your technique ten years ago, it would have saved me so much time! Looking forward to reading your future posts! 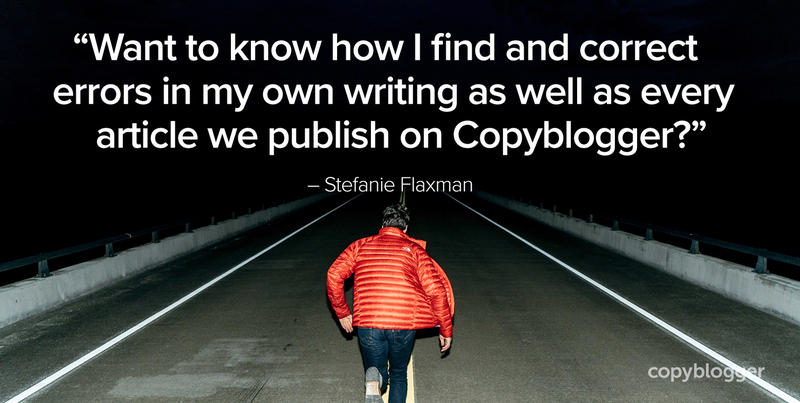 Hi Stefanie Flaxman, thanks for providing us with practical tips on proofreading. Reading backward, from the last sentence to the first is really helpful. This slows down our reading, and we are able to catch more typos or missing words. Also, changing the font size helps in proofreading. I always get somebody else to look over my work before posting as I am notorious for zoning out during the writing process. Even though I have a good level of grammar, your head can sometimes race ahead and you are already thinking about writing the next paragraph. Slowing down might be the next logical step because as you say, when the error leads to the typing of a word, even a wrong one, it is difficult to spot. Great thoughts shared here Stefanie. When I proofread content, I like to read what i have written slowly and loudly. When you read, you tend not to omit words. I also generally proofread content only after several hours have gone by since I wrote that piece of content. That way, I can avoid the bias your brain has to correct typos automatically, since it just wrote out what it “believes” is great content, just because it is super-familiar with it. Thanks for sharing your great post! I edit and proofread a lot of book manuscripts. Going slow is key! I’ve also used the reading backward tactic, especially when working with a particularly stubborn section of writing. Changing your perspective like that helps so very much.